There have long been rumors that Apple will be coming out with a new Apple TV to replace the aging device that hasn’t been updated for several years. The first clue that it might happen soon was when Apple recently lowered the price of the current Apple TV to $69, suggesting that the company might be trying to clear out inventory. And now Apple’s website shows that the current Apple TV is no longer in stock and gives a ship time of one to two weeks. This sort of thing usually happens in advance of an updated device from Apple. It now seems likely that Apple will announce a new Apple TV at the Worldwide Developers Conference scheduled for June 8–12. Rumors for the past 18 months have suggested that Apple would open up the Apple TV to developers, and now it may be happening. Here’s a rundown of what’s been rumored. Many are expecting Apple to introduce a new Apple TV that will run apps, including games, and that they’ll launch an Apple TV App Store. In addition, many are expecting this new Apple TV to be a central controlling device for the new smart-home accessories that are compatible with Apple’s HomeKit. Also, given that Apple a couple years ago purchased a company that developed some of the motion-sensing technology used in Microsoft’s Kinect, many are expecting that the new Apple TV will include motion-sensing capability. Also, it seems likely that it will include Siri. If all this is, in fact, true, we’ll have a second major new platform from Apple this year. It would be big. Just as Apple is now already dominating the wearables market with the Apple Watch, it would also likely dominate the market for smart home and Internet streaming devices. While all of this is based on rumor, and while we won’t know until WWDC whether any of it is true, what strikes me is that there’s no reason for Apple not to do this. It seems like a no-brainer. All the pieces are already there. 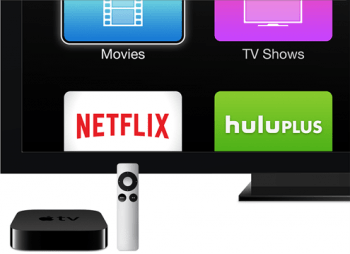 Why wouldn’t they open up the Apple TV to developers? Also, Apple is falling behind Roku in the market for Internet-connected set-top controllers, so they need to do something in order to keep up in this arena. Even Google’s Chromecast reportedly took over second place late last year, leaving Apple in third. But there’s no doubt in my mind that if they launch the above-described Apple TV, they’ll quickly lead the industry. Finally, even the invitation to WWDC 2015 seemed to include an image of an Apple TV. This entry was posted in iRumors and tagged Apple TV, irumors, iRumorsnow. Bookmark the permalink. This is what new Star Wars droid BB-8 would look like in space gray.